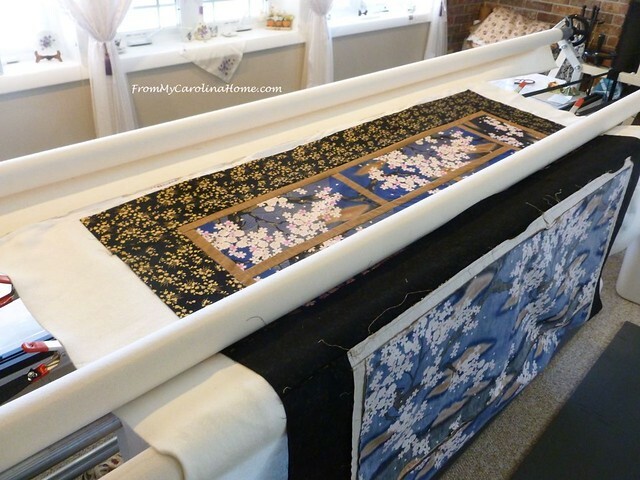 The Japanese inspired art quilt was loaded on the longarm for quilting, and I knew before I put it on how I wanted to quilt it. There are some fan shapes in the print, and one of my new pantographs has the same feel. 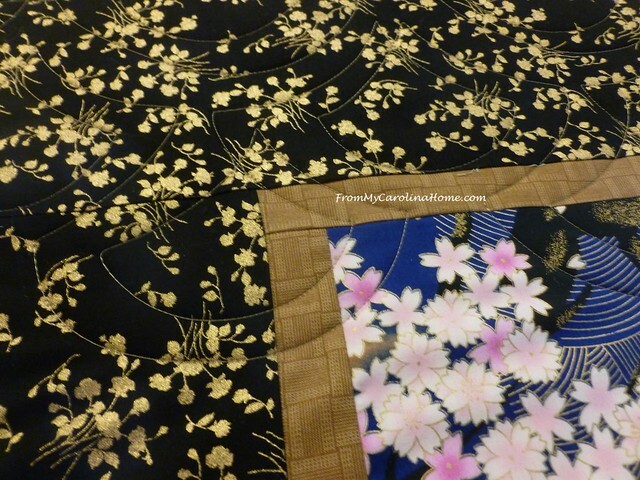 I have a lovely golden brown polyester thread that is very close to the gold in the print, and blends well with the sashing fabric and the backing fabric. So, decisions made, the quilting began. 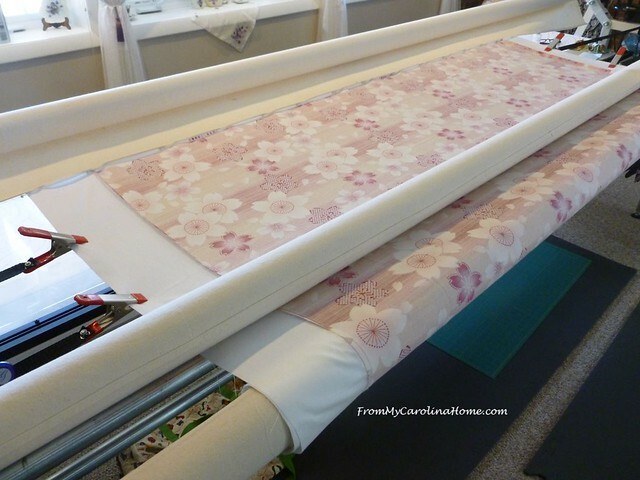 I really wanted to use the pretty pink print for the backing, and this was going to be my first quilt with the bamboo and silk blend batting from Quilter’s Dream called Dream Orient. But the print wasn’t quite big enough for the longarm. It was only about an inch wider and longer on all sides, and I need at least four inches all around. But it is perfectly acceptable to add onto the backing to make it work. So I added white strips. Loading it, you can see how this helps. Now the clamps have plenty of clearance from the machine’s base. I added the strips to both sides. Loading the batting and then floating the top, you can see how close this is going to be. I will have to be very careful to keep the top straight and within the backing fabric allowance. The top was placed as close to the selvedge edge of the backing as I could get it, without going into the selvedge, to allow all the extra inches at the bottom. 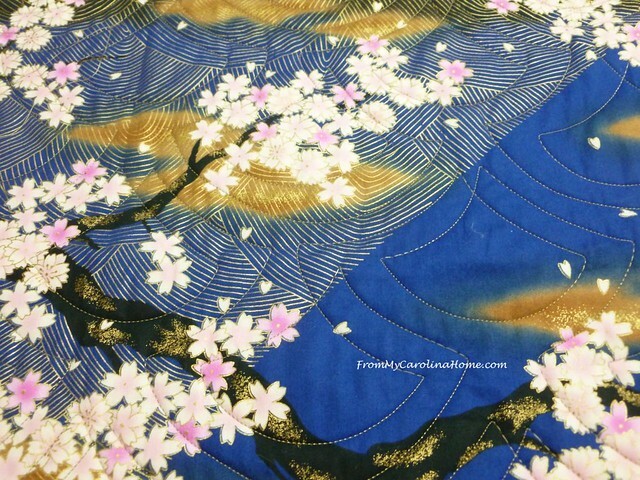 The print that I used for the front has this lovely design, which was a perfect inspiration for the pantograph choice, appropriately the panto is named Geisha! The upper thread is a polyester with a nice shine in a golden brown, with Aurifil in the bobbin. 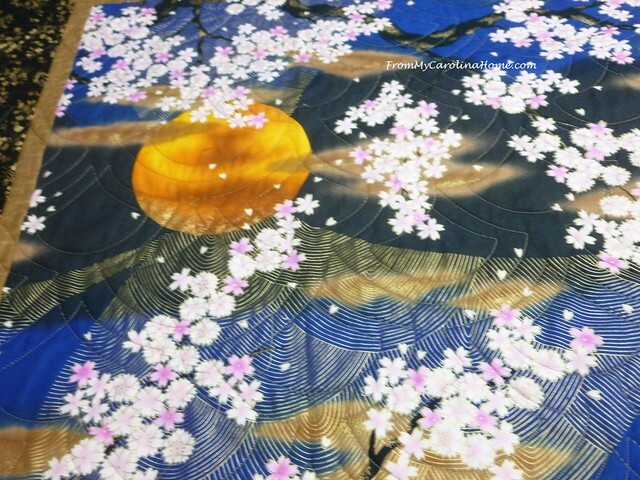 It blended well with the gold print, and accented the lines of the cherry blossom fabric print. 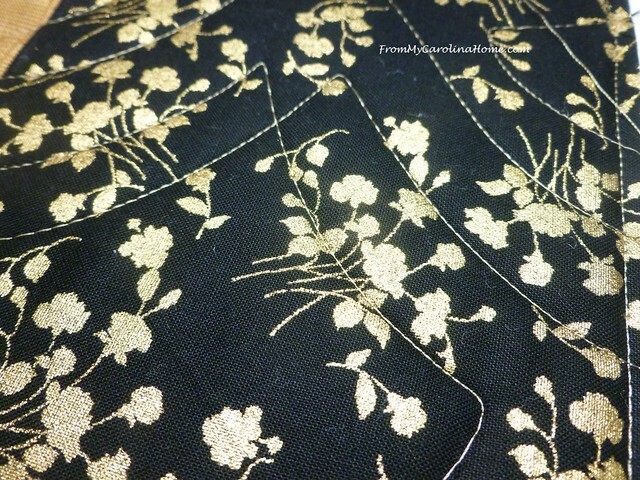 Here’s a close up look at the gold and black border print with the thread. You can see how the print and the pantograph echo each other. Once again, this was not a panel, it was a print that I cut up. It almost has a ghosting effect, the golden color of the thread works nicely. A few evenings of hand whipping the binding as I watched the Olympics, and it is done. 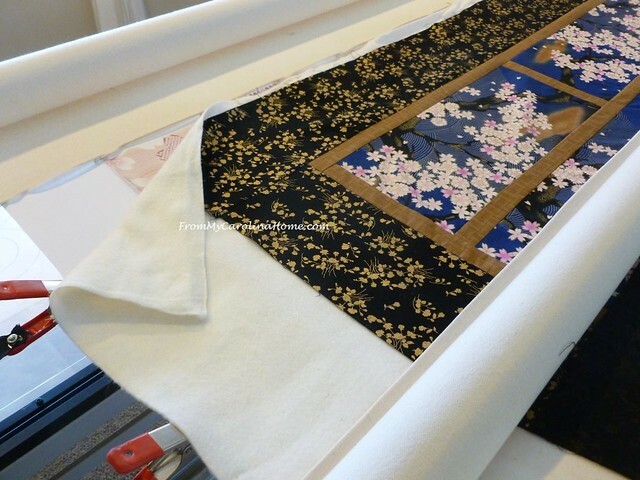 The binding is the same fabric as the framing. The final size of the art quilt is 53-1/2 x 74. I love the Dream Orient Batting!! It is soft and lightweight, and just quilted beautifully. 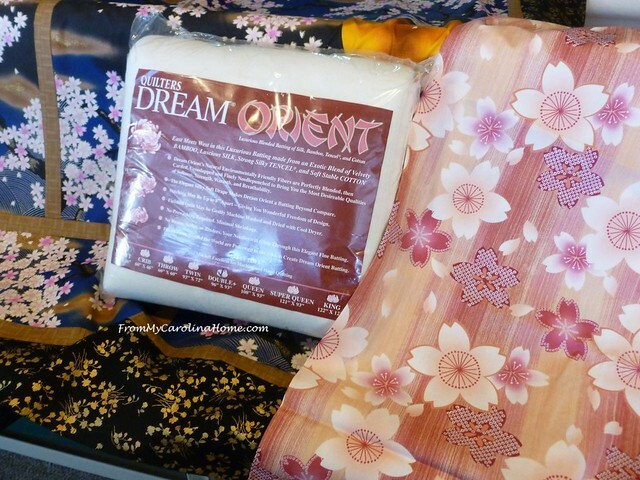 Congratulations to Margaret who won the Dream Orient giveaway last week. Today is the final chance to enter the Aurifil East Meets West Thread Collection giveaway. 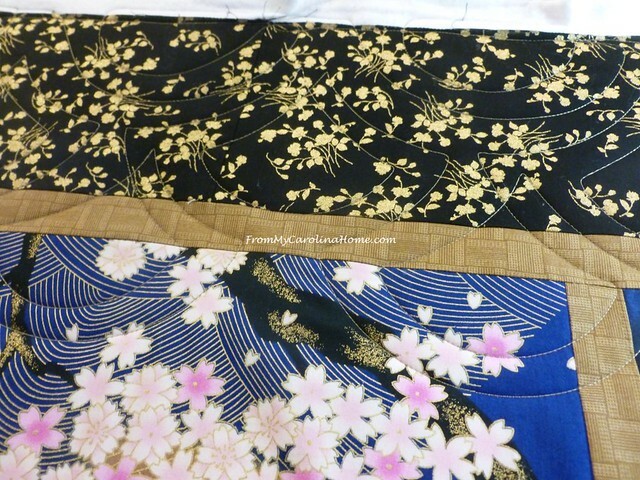 See my post on Omiyage. The winner will be drawn tomorrow. It is hanging on the quilt rod in my fabulous basement studio space. It still needs a label, but I’ll get to that soon. 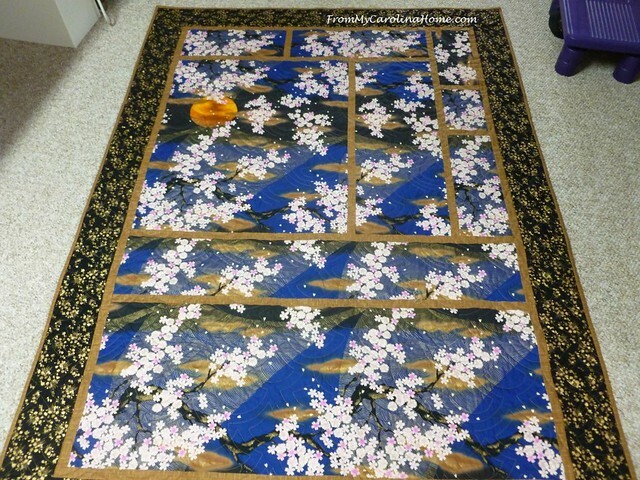 If you would like to see the original post on how I constructed the quilt with Japanese print yardage, click on Sakura Tsuki Art Quilt. Have you made an art quilt? Have you tried bamboo batting? Get Dream Orient Batting at Amazon. Thank you for using my affiliate links!! It’s beautiful and so relaxing to look at. 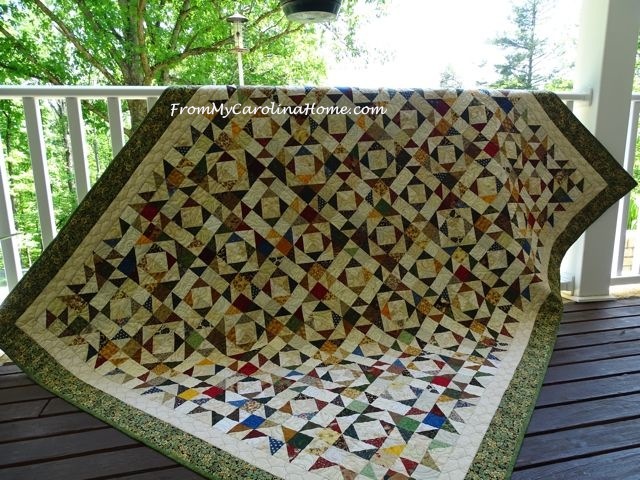 Your quilt is absolutely stunning……Luved the explanation of how it came together in your former post…..Dot M.
love the quilting you did on the quilt and it looks so pretty hanging, I think I have 3 labels to make – I keep forgetting about them and I used to be so good and would have a label ready when the quilt was done. Carole! this turned out beautiful. You really came up with the most perfect idea for this fabric! 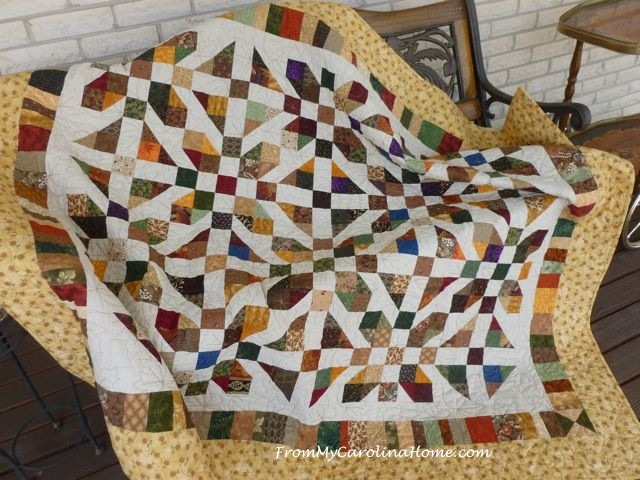 The quilt is just stunning and your perfect design of quilting just takes it over the top. I’m sure you’ll smile every day looking at it when you go into your studio. PS – package arrived safe and sound…I’m not opening until a special occasion! Wow! Stunning. You out did yourself on this one. Oh so very pretty!! Your quilting choice is spot on. This is absolutely beautiful! Thank you for all the extra work you did to share with us. batting is to quilt with. So happy for you to have that quilt now hanging in your studio. That’s so pretty, Carole! 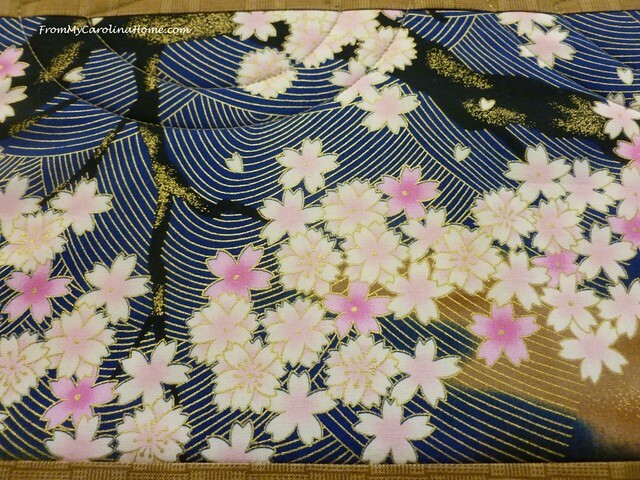 I really like the pretty Oriental flower prints, and the way you broke it up with framing. That backing is perfect for it, too! Hello Carole; This is beautiful! Exactly like a picture of art on the wall. 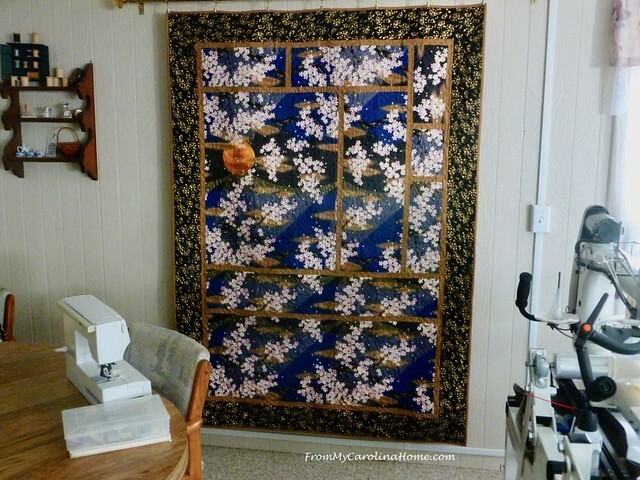 You did amazing detailed quilting that worked so perfectly on this piece also, Carole! I have not done any type of quilting like this. I do not think I have any fabric this beautiful to do something like this with. I hope that you have the opportunity to do this again if you enjoyed it! Have a great day! Lovely quilt, Carole. I was fascinated with the process you described. I have not tried any of the bamboo battings, but have recently purchased Hobbs’ wool batt. 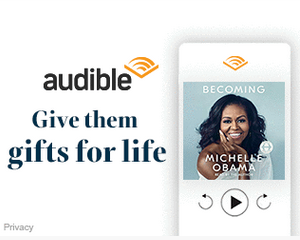 I have a question re your affiliate link to Amazon…..can I access your link to buy other items, such as books, DVDs, etc.? Yes! Thank you for asking, any purchase made after clicking my link helps. You don’t have to buy the item you click on. 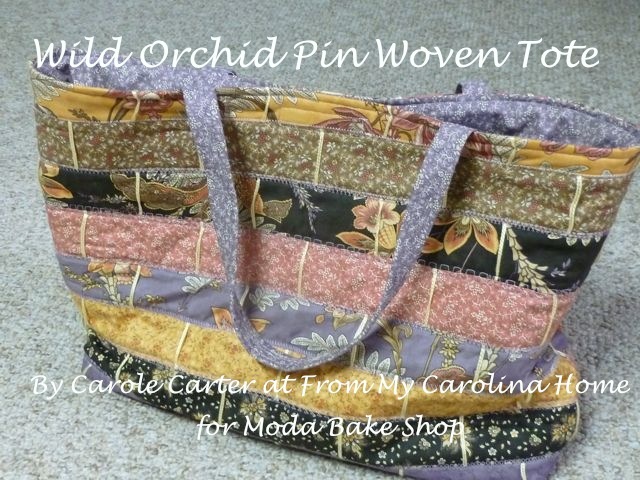 Carole, you created such a beautiful piece of art with your fabrics and I hope you are going to keep it for yourself, giving you the inspiration to make another one at some point. I will probably never make one, as I am kept very busy making items for our 4 children, 10 grandchildren and soon to be 10 great grandchildren. At this point in my life, I enjoy doing this and trying to use up as much of my STASH as possible. 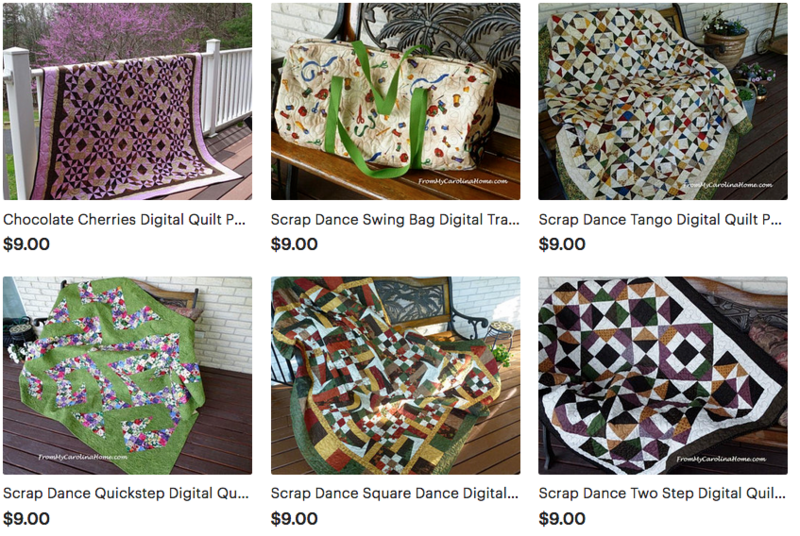 I do enjoy admiring all the beautiful quilts created by people like you and some of the other blogs I follow. 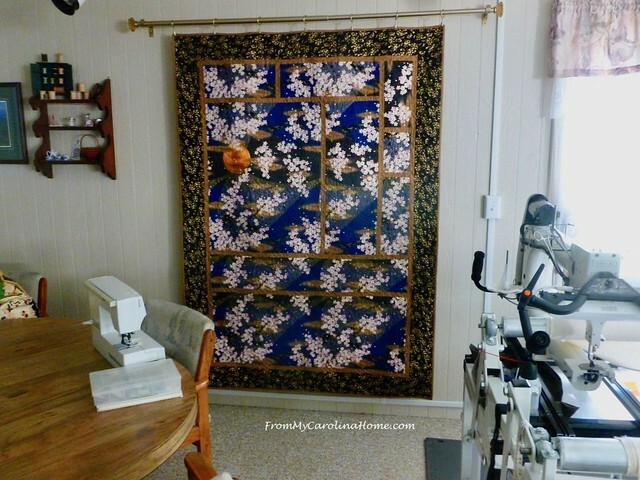 That’s a great addition to your sewing studio! 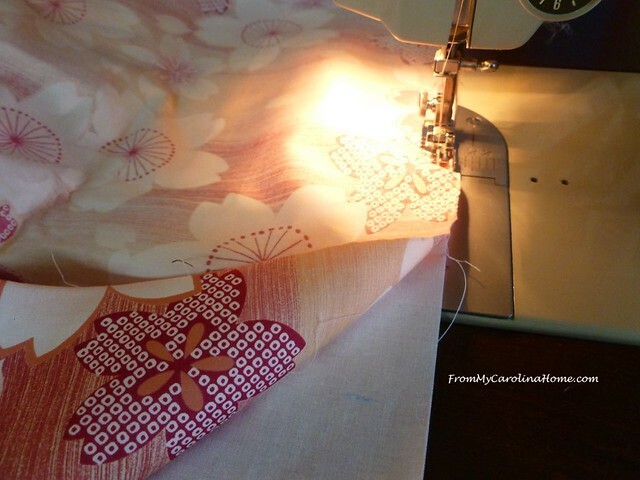 I love the pantograph, such a great match with the fabric! Yes, I did try the Bamboo batting. In a baby quilt. Wrong, wrong, wrong. Bamboo has very special washing instructions that I did not read. After finishing the baby quilt, I washed it in warm water. The batting shrunk about 20%. The whole quilt was ruined. I threw it away! It was like a rubber band, I could stretch out the batting to fill the very wrinkled fabric. I was going to try to quilt it more as I only gridded 2″ apart. Just too hard to pull and quilt in between my grid….nice for a wallhanging that probably won’t be washed. It has a nice hand and is good for the environment but not in a baby quilt that will be washed a lot. I learned my lesson. Yes, you are so right! Bamboo cannot be put in a drier, it will shrink badly as you found out, and in a hot drier will melt. 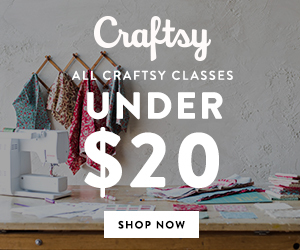 It is great for summer quilts and wall hangings. 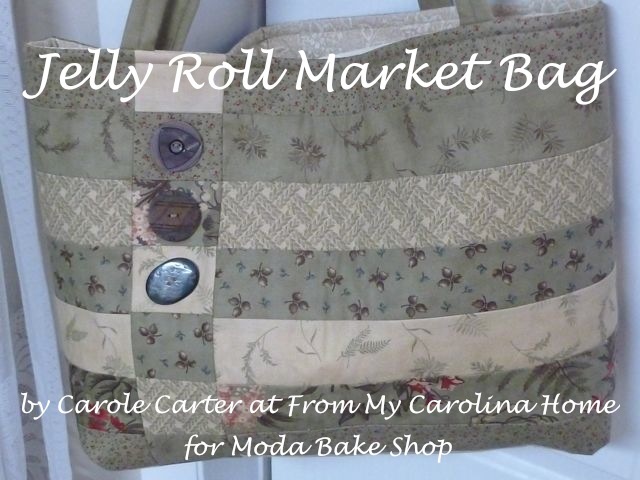 Carole, what a great way to showcase that print! And the quilting is perfect for it. That is a lovely finish. great work with the tight fit for the backing. Definitely worth the trouble. 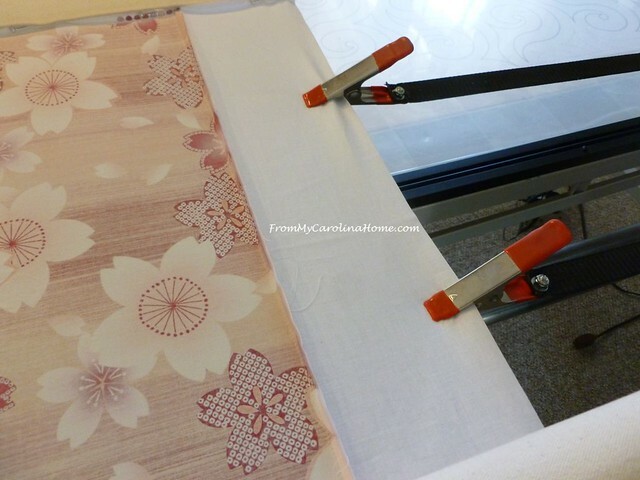 Great choice of pantograph, too, especially with the pattern in the fabric. It looks wonderful hanging on your wall. 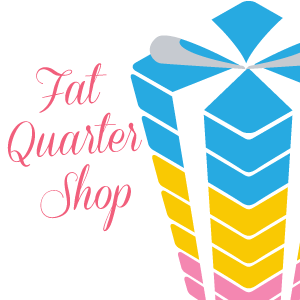 QD is the only batting I ever buy, and I get it directly from them. I have thought of trying this one, but the right project hasn’t come up yet. I really admire this quilt. Your concept and the fabric were perfect, and it’s a lovely quilt. Beautiful quilt and quilting! I haven’t tried bamboo batting yet. Reading the comments, I didn’t realize how much it will shrink!